Deep in the Sahara Desert, France explodes her first atomic bomb, despite objections from the Afro-Asian nations and the disapproval of both the United States and Russia. A fireball with the destructive power of the Hiroshima A-bomb signals the French claim to membership in the "nuclear club" of nations. 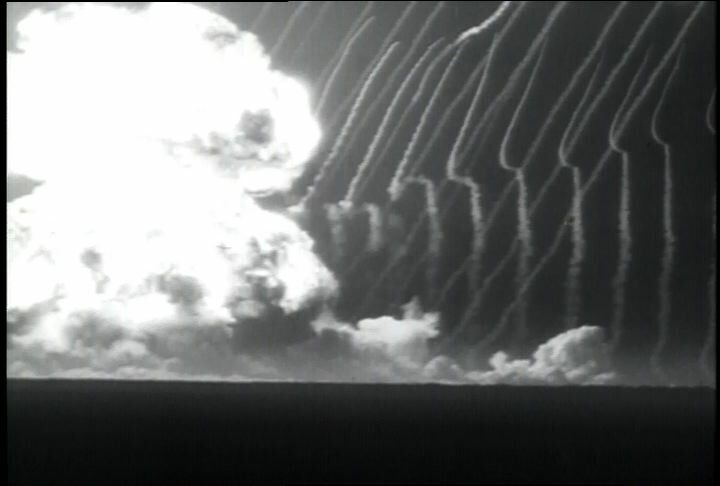 Chicago: “War and Peace in the Nuclear Age; Education of Robert McNamara, The; Sahara A-Blast: France Tests Her First Atomic Bomb,” 02/15/1960, WGBH Media Library & Archives, accessed April 26, 2019, http://openvault.wgbh.org/catalog/V_8BF4C0A2C7804EB8B29DBF5D1E46E1F4. MLA: “War and Peace in the Nuclear Age; Education of Robert McNamara, The; Sahara A-Blast: France Tests Her First Atomic Bomb.” 02/15/1960. WGBH Media Library & Archives. Web. April 26, 2019. <http://openvault.wgbh.org/catalog/V_8BF4C0A2C7804EB8B29DBF5D1E46E1F4>.